There is no question in my mind that the path we're embarking upon is littered with, reeking of, completely composed of sheer nonsense. We're moving into an evaluation system that relies on "value-added" information, information that can make an exemplary teacher look like an utter incompetent. And we're also playing right into the hands of "reformers," yet again. As it happens, I've been called upon to raise test scores, to clean up after others have not done so. I've been able to do it. Does that make me a good teacher? I don't think so. It makes me a determined taskmaster. If you tell me these kids won't graduate unless they pass a test, they will golly goshdarn do so, and no, I didn't cheat to make it happen. I simply drilled them to death in a joyless spiral, never ending until they reached their goal, whether they wanted to or not. I've done things I'm proud of, but that's not one of them. 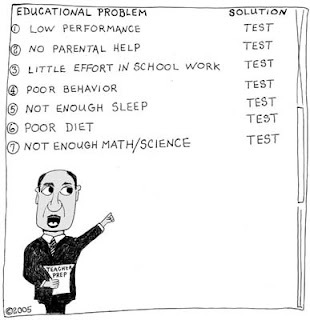 A problem is you can't always raise test scores. What if the kids have 95 averages? Can you get them to 97? Does it even matter? At some point, students are excellent. There's nothing more frustrating to me than meeting a parent who chides a kid for getting a 98, when only a hundred will do. Your kid is wonderful, I say. If she were my daughter, I'd wear sandwich signs, beat a bass drum, and shout to everyone up and down Main Street that she was mine. Still, what if she were in my class and I failed to get her to 99? What if she went down to 97, or worse, 96? Would that give me a negative value-added, like the poor woman in the linked article, the one denied tenure based on nonsense? The one who'd be in line to be fired under the scenarios laid out by Mayor Bloomberg and the acolytes he's purchased at E4E? There is a national insanity, rooted in the idiotic and witless assumption that every child in the United States will be not only constantly improving, but also passing absolutely everything by 2014, otherwise known as No Child Left Behind. Our current President, Barack Obama, has assumed the education mantle of George W. Bush and is continuing this fanatical, nonsensical policy to the benefit of no one but demagogues who wish to undo public education. Joel Klein is taking millions to figure how to replace teachers with computer programs. A teacher can turn a kid's life around. A teacher can negotiate the tough paths teenagers face, show them options, talents, passions. A teacher can inspire a child to be virtually anything, anyone. A teacher can open a child's eyes, sometimes literally, but more often to possibilities the child would never imagine alone. A teacher can give kids what they don't get at home, for whatever reason. A teacher can show kids that life is full of joy, that there is humor in everything, that people are full of love and hope and things they'd never imagine without a helping hand. A teacher can unlock mysteries, open doors kids never knew existed. But in 2011, in these United States of America, the only value a teacher has is to improve test scores. Fail that task, and nothing else matters. You're fired. Good luck at whatever job you can muster with that on your resume.